MISSION, KS--(Marketwired - Mar 24, 2014) - (Family Features) Long hailed as sweetly satisfying, watermelon may not be the first tasty fruit that comes to mind when you're thinking nutrition. But in fact, watermelon is not only a perfect on-the-go snack to satisfy your sweet tooth, it's also incredibly healthy. Watermelon contains higher levels of lycopene, an antioxidant, than any other fresh fruit or vegetable. It's also is an excellent source of vitamins A and C, as well as providing vitamin B6 and potassium. Health benefits aside, the crisp, sugary flavor of watermelon makes it a favorite for kids and adults alike, especially during the warmer months. Its firm texture makes watermelon ideal for a variety of recipes, many of which are a natural fit with today's busy households. 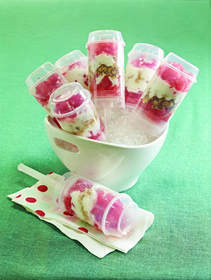 Add some sweetness to your morning and try Breakfast Push Pops for a hands-on treat kids will love. Watermelon Slice Popsicles are an easy, fun take on a traditional watermelon slice, and the built-in "handle" makes cleanup a breeze. For more recipes and a section dedicated to kids' learning and games, visit www.watermelon.org.